I have been a fan of Daring Kitchen – Daring Bakers and Daring Chefs Challenges since a long time. Although currently with a baby and all his shenanigans, I find it difficult to make the challenge every month. But I sure bookmark them for whenever time permits. These Indian Biscuits were hosted by Aprarna of My Diverse Kitchen somewhere back in August 2013. I had them written in a tiny little recipe book I maintain. 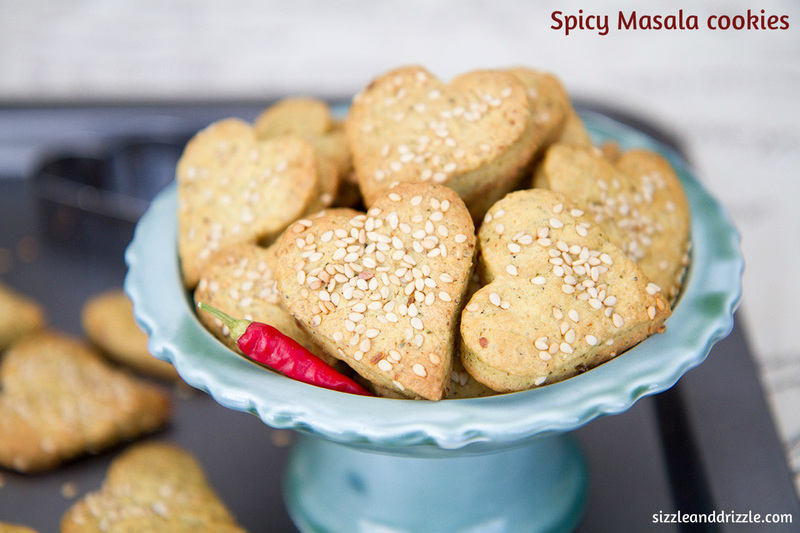 And finally last week made these crisp yet flaky (and quite spicy) Masala cookies. The crisp crunch of the cookies as you bit into the them with the chillies is quite good. 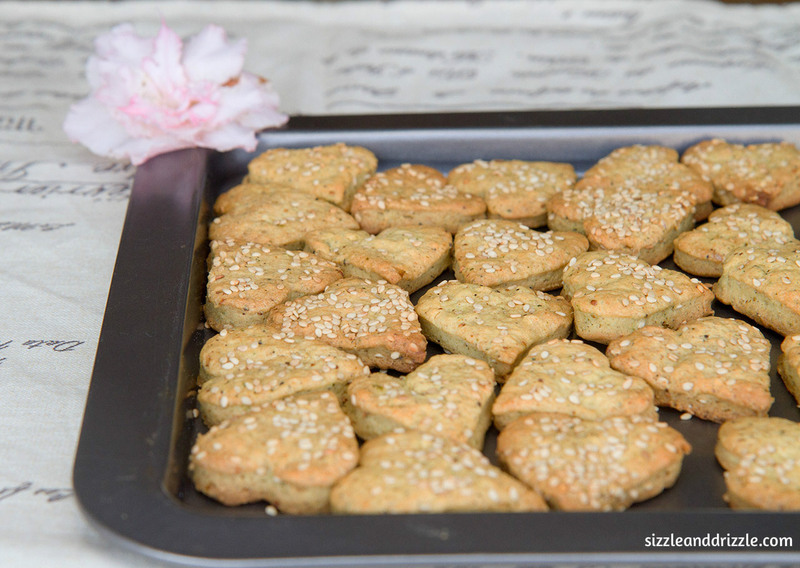 When I made these biscuits the second time, I replaced the curry leaves and pepper with a generous amount of homemade garam masala and it tasted delicious. 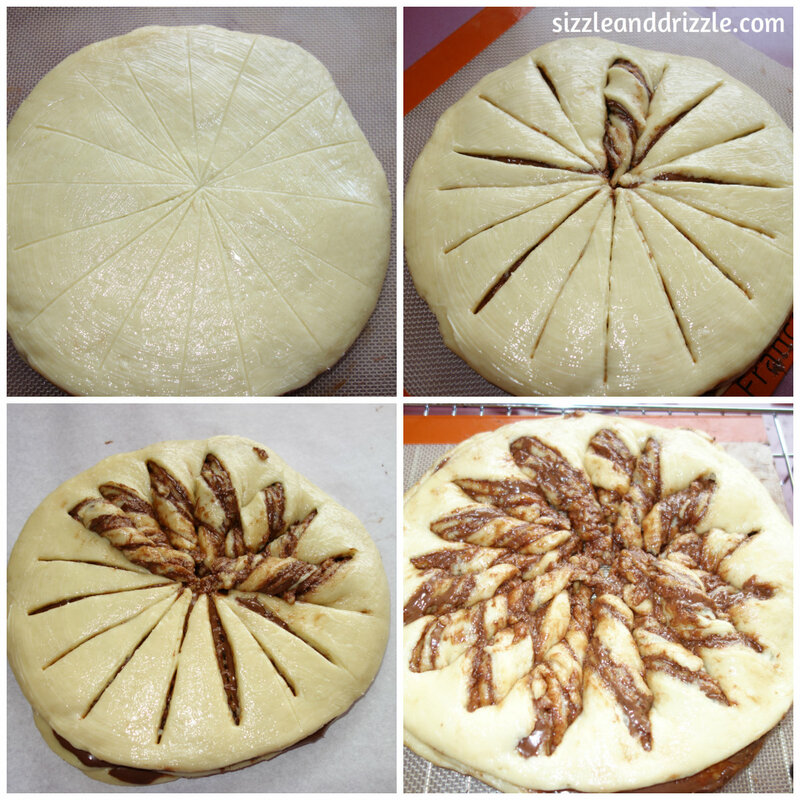 Here is the adapted recipe from Daring Bakers . You can sure make your own variations. Mix together all purpose flour, baking powder, baking soda, rice flour and corn flour. To that add diced cold butter cubes and mix it with a hand blender till the texture becomes like sand. Now add pepper, curry leaves, chilli powder, sugar, ginger garlic paste and yoghurt. Mix well with the blender. The dough should be moist, not wet. 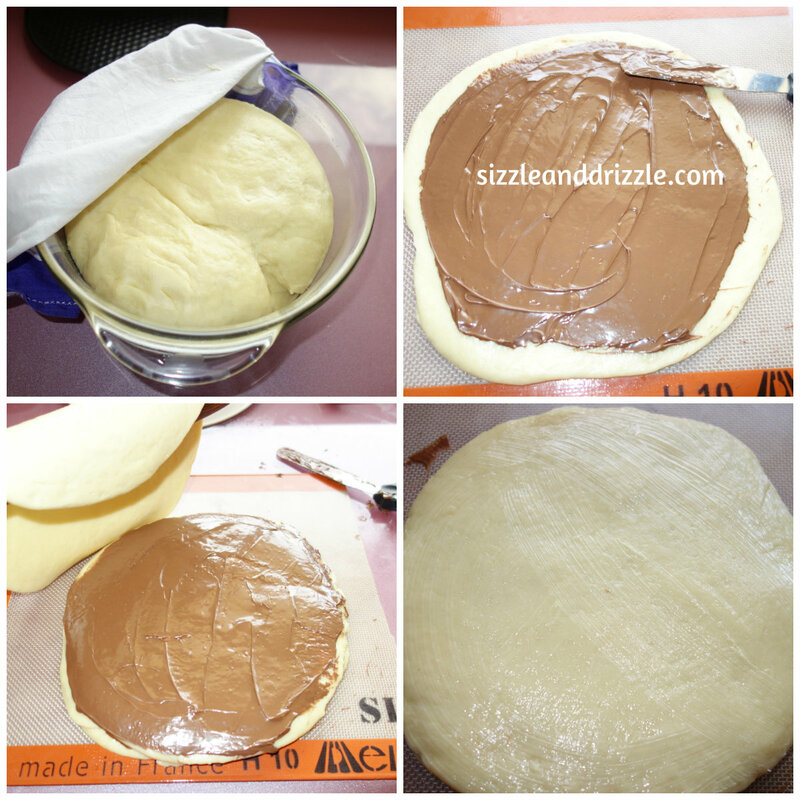 Pat the dough into a thick disk and place it in a saran or plastic wrap and keep it in the fridge for atleast 3 hours. I kept it overnight. Preheat oven to 160C and line a baking tray with parchment paper or silicone baking mat. Lightly dust your working surface with all purpose flour. Roll out disks of flour to 2-3 mm thickness. Cut shapes with a cookie cutter. Transfer to the parchment line baking tray. Spread on with some sesame seeds and press down. Gently brush with some oil and bake for 20-25 minutes till the brown from the bottom. Let them cool on the tray for 5 minutes and further on a wire rack. Once completely cool they should be crispy. Baking time will depend on the thickness and size of your cookies. The first 8 ingredients form the base of the cookies. You can replace the next ingredients with spices of your choice. They will also taste good with Italian dried herbs and fresh basil. 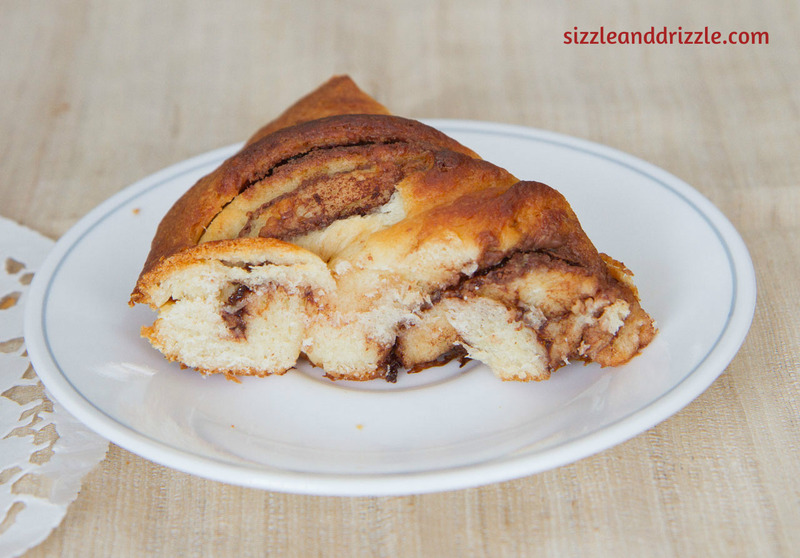 Nutella Bread twists. So not grumpy. Sometimes, for no real reason I feel grumpy towards the whole world. As if whole of humanity has err-ed and I am their only savior. I go around pretending being calm and collected, but I am seething from the inside. My responses are cold and I avert eye-gaze and keep busy in seemingly important and un-important chores. Sure, something somewhere has disturbed me, but it’s really not that big as I make it out to be. Earlier, all the brunt of my internal conflict would fall on my dear mom. She would bear the sulking me with kindness only mothers are capable of. But since I got married, and especially since I started writing on my blog, I have been able to tone down the tantrums. Sure, I am still exceptionally silent on those occasions, but no tantrums. No crying and no saying nasty things. But it needs a constant reminder to myself to keep it up. I need to cry at-least once a month. Call it the war of the hormones, or just being a woman. So the best, and safest option for everyone around, is watching a good emotional movie. And crying. But if that does not happen, it leads to this. I ought to get a reality check once in a while, or the ‘damsel-in-distress’ attitude of mine goes off the roof and I start thinking that I am the most hard-working girl of all times. Duh. 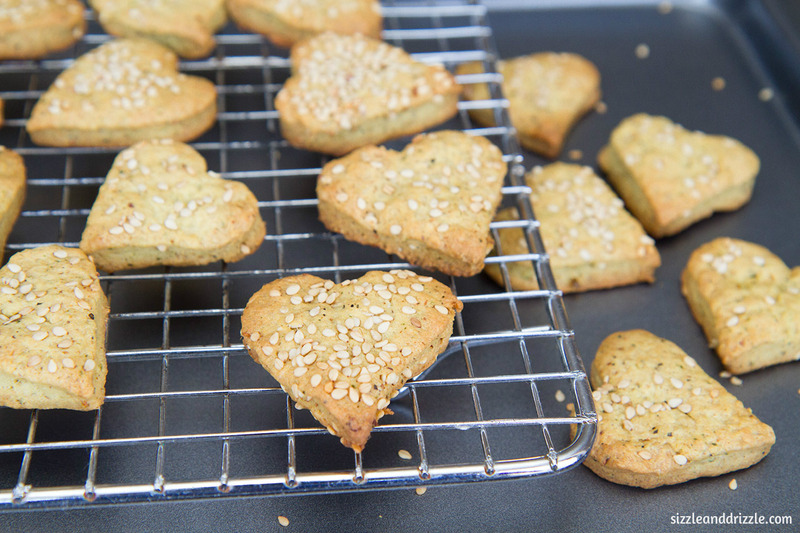 And strange as it sounds, I need to blog, bake and generally do my own thing once every week. If the entire week goes by without any respite from work and daily conundrum, I go crazy. Now all these things seem manageable, but they are not, if not carefully managed. Which is what happened last week. And now I hate having spent a whole Sunday disgruntled. It wont come back. That Sunday is lost on me. I am glad my husband doesn’t give up on me and waits patiently for the Cancerian crab to come out its shell. Or else I am doomed. 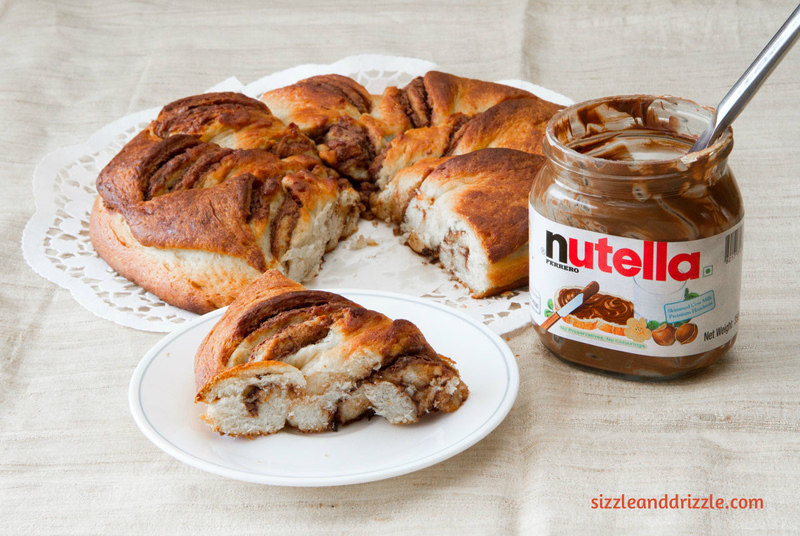 The only flicker of hope in this god-damn-it melodrama was this beautiful Nutella bread. And that my best-friend’s husband was intrigued by it, I baked this bread twice. Once alone and once with him. Beauty surrounded the Daring Bakers this month as our host, Sawsan, of chef in disguise, challenged us to make beautiful, filled breads. Who knew breads could look as great as they taste? They are still intimidating to me, but I believe in Daring Bakers, and till date I have not been let down. Although I must admit, that the first one was with 16 twists. it was more complicated but somehow it looked messy when I baked it. hence this second one, with just 8 triangles of twists. Much more manageable. 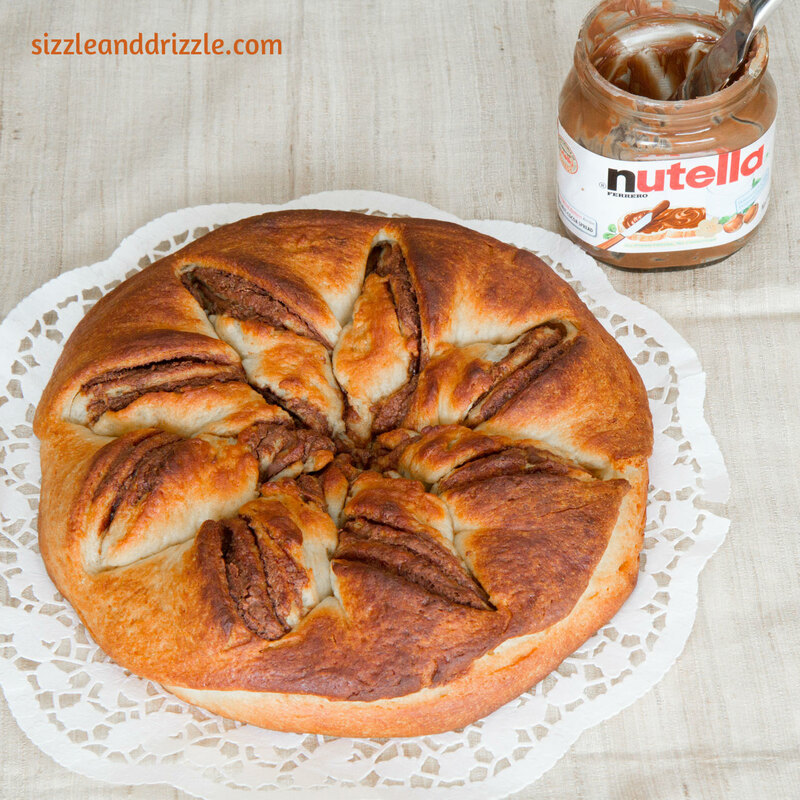 And Nutella spread in three layers of the dough disks, what’s not to like in it? And baked into a fluffy bread. I could even lick off the jar. Top with the fourth layer, this time only brush it with butter. Using a knife make cuts that divide the dough circles into 8 triangles starting at the center but don’t go all the way to the outer edge. Then divide each triangle into two (2) . That gives you a total of 16 triangles. If you prefer Stay with 8 triangles. Gently lift the triangles one at a time and twist them. Bake for 5 minutes on very hot 500°F/240°C/gas mark 9, then lower the temperature to moderately hot 400°F/200°C/gas mark 6 and bake for 15-20 more minutes (ovens do differ greatly, so the time may differ… what you want is to bake it until the under side is golden brown). Remove from oven and let it cool. The egg-wash replacement recipe is a keeper. Save it. You can replace Nutella with any flavored butter. Next I will be trying it with some strawberry butter.